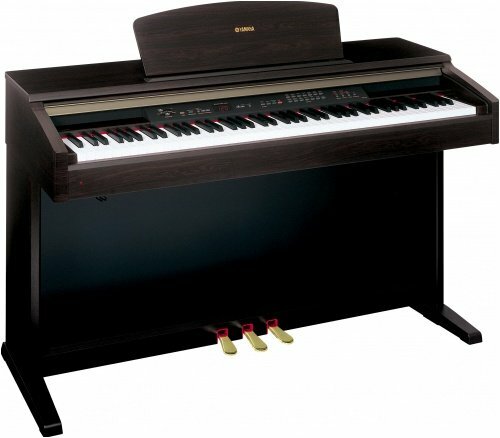 The Yamaha YDP223 is an 88-key digital piano that works with intermediate and advanced pianists. It has a sounding and performance that can closely emulate those of a concert grand. Moreover, it has an appealing design that can please your eyes as well. On our part, we do consider the Yamaha YDP223 as an excellent digital piano. Although they are almost quite the same with the Yamaha YDP113, their respective features are already world's apart. 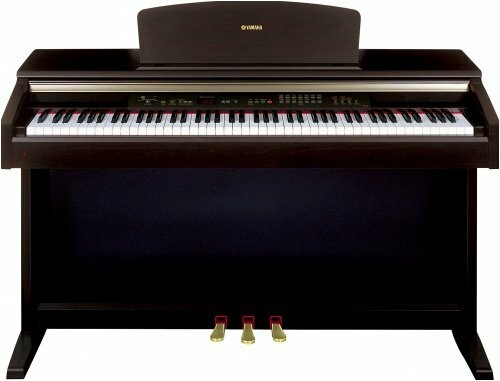 You can learn more about this digital piano by reading this Yamaha YDP223 review. Sleek and classy. These are the two things that perfectly describes the Yamaha YDP223. Specifically, the walnut finish with dark satin color imbibed the instrument with aesthetics that would perfectly suit any modern households. We also noticed that the layout of the Yamaha YDP223 appears to have a semblance to most of Yamaha's acoustic pianos. This instrument has a compact design. Therefore, it won't take up so much space. However, this one has a weight of about 110 pounds, which makes it a little heavy. But it should not surprise you, as this one has a solid cabinet construction. Overall, it is a product that would please you. The Yamaha YDP223 exhibits a natural and realistic "feel" of its keyboard, thanks to its graded-hammer action. In short, it is a digital piano that can replicate the quality of an acoustic piano. You can just feel that the bass side is heavier compared to the treble part. It is pretty articulate and can unleash all the dynamics that you want for your play style. Since it is an 88-key digital piano, the Yamaha YDP223 is indeed a perfect choice for advanced practitioners. It won't restrict your skills since it can handle complicated chord progression, thanks to its 64-note polyphony. You can play different voices at the same time without any cutout. The sound repository of the Yamaha YDP223 is pretty vast. It comes with a set of high-quality sound samples that could help improve the quality of the music that you are creating. Particularly, it has fourteen different instrument samples, which range from electric pianos down to harpsichord. Moreover, the YDP223 also features over 50 song presets and an extra music book that can help you practice. The effects, timbre selector and the track sequencer further improves the sounding of this instrument. Therefore, it is among the most versatile high-grade pianos that we ever tested. When it comes to sound quality, the Yamaha YDP223 is way above its competitors. The realistic grand piano sound that this device has can certainly surprise even piano connoisseurs! This performance is due to the usage of an advanced stereo sampling mechanism. Specifically, Yamaha has recorded the sound of their concert grand into three levels: hard, medium, and soft. They did it without missing the subtle stereo details, which makes it truly impressive. There is also two acoustic piano presets that you can access in the Yamaha YDP223: the Grand 1 and Grand 2. The Grand 1 is a perfect accompaniment for jazz and classical songs. Meanwhile, the Grand 2 is quite bright. Therefore, you can use it for more aggressive genres like pop and rock. Can only record one song at a time. The keys of a digital piano could go from 61-keys to 88-keys. The 61-key models are perfect for beginners because they have a simple interface. But for intermediate and advanced practitioners, this number is not sufficient. It doesn't contain the proper amount of keys that would let them access all the piano chords and notes. Therefore, they should go to 88-key models. The polyphony of a piano is a mechanism that would allow you to play different voices at the same time. This is essential especially if you are playing complicated pieces like classics. We all know that such genre involves a series of sophisticated chord progression. If your digital piano doesn't have enough polyphony, then its performance would be limited. Ideally, you should choose a digital piano with 64-note or 128-note polyphony. In this way, you can always do advanced playing techniques without hindrances. Meanwhile, sampling is the process of recording sounds and integrating it to the digital piano. You should know that it is impossible for modern keyboards to replicate the sound of real acoustic pianos. Fortunately, manufacturers have solved this problem by using stereo sampling. They would record distinct sounds coming from different instruments (e.g. electric pianos, concert grand pianos). After that, they would process it until the sound would no longer be artificial and flavored. There is no denying that pianists all over the world have the Yamaha YDP223 on their wishlist. With its premium quality and construction, this digital piano can quickly tackle different applications and preferences. It is quite a best-seller, as it can quickly run out of stock. On online music forums, this piano has been part of the constant discussion. It seems that it got the attention of all piano enthusiasts. Overall, the quality of the Yamaha YDP223 is ideal for advanced practitioners. Since it doesn't come with the Yamaha Education System (YES), we could barely suggest this for beginners. Although they can buy this one, there are no guarantees that the device can teach them the ropes of a digital piano (except if they have music teachers). But putting that aside, the Yamaha YDP223 has an excellent construction. It is among those digital pianos that you can use a decoration because of its beautiful appearance. When it comes to sound quality, this instrument doesn't falter. Did you learn from this Yamaha YDP223 review? Tell us your thoughts about this digital piano in the comment section below!